In my neighborhood, the majority of houses have a storage shed tucked somewhere in the backyard. It’s often placed in the most inconspicuous location on the lot with little attention given to its scale, its design, or the quality of its materials. However, by paying attention to the scale of a storage shed and by placing it sensitively in the landscape, you can transform it into a garden shed, a decorative focal element in the yard. The first thing you need to determine is the size of the shed, a function of both the shed’s purpose and the size of the garden. Start by considering how the shed will be used. Will it be available for an activity such as potting? Will it be a backyard destination with an adjacent sitting area or patio? What items will be stored in the shed: outdoor tools and toys or overflow items from the house? Make a list of the things you want to store to estimate the space you need. At a minimum, a garden shed needs to be 3 ft. deep for storage. Shelves maximize storage, but they should be at least 13 in. deep. To improve access, consider double doors to expose more of the interior. If the shed will be used for an activity such as potting, you’ll need a small work area inside or outside the structure. I like a counter about 3 ft. long and 2 ft. deep. For an inside workspace, you also need room to move around, generally about 3-1/2 ft. of depth (enough for a small chair). A shed that is too large will look out of place and will diminish the usefulness of the yard. I prefer to limit the footprint of the shed to a proportion of garden size. For small gardens (up to 900 sq. ft.), the shed can be up to 3% or 4% of the garden. For a garden between 900 sq. ft. and 1500 sq. ft., devoting 5% to a shed is OK, but generally, I would not exceed 100 sq. ft. In a garden 3000 sq. ft. or larger, I suggest limiting the shed to 150 sq. ft. This shed draws inspiration from the house, sharing the primary siding and trim elements. It’s appropriate to reduce the size of the shed’s details proportionally to match its smaller scale. 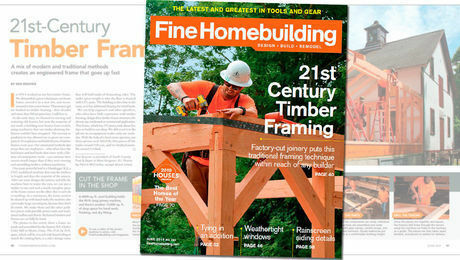 For example, the siding exposure might be reduced, and the rafter tails might be 2x4s instead of the 2x6s on the house. 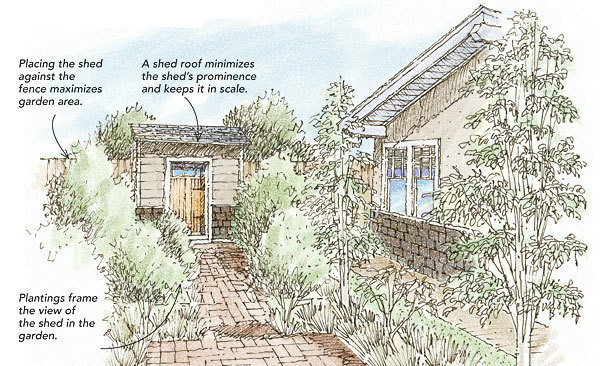 The roof’s low pitch helps to keep the height appropriate for the shed’s 4-ft. by 6-ft. footprint. On small sheds, avoid steep roofs such as a gambrel or front gable. Although there isn’t room for a window, the small glass lites in the door offer enough transparency to prevent a fortress-like feel. The garden’s style also influences the shed’s placement because the structure should be an integral part of the garden design. If the garden has a formal layout, the shed will likely play a major role as the focal point of several views within the garden. 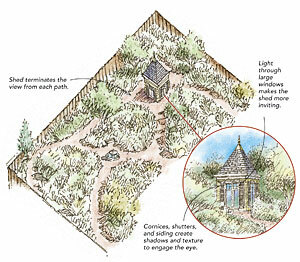 In a more informal or picturesque garden, the shed can be placed along a meandering path or be revealed slowly through layered plantings rather than be seen from all vantage points. As you think about placement, consider the shadows that the shed will create. Placing the shed on the north side limits shadows and maximizes sunlight in the garden. In a small yard or garden, even a small shed immediately attracts the eye and becomes a focal point, so don’t try to hide it by tucking it into a corner. This shed is probably slightly too large for the space, but the problem is exacerbated by a flimsy-looking roof, monolithic facades, and poor-quality materials. Generally, the shed’s style draws inspiration from the house. However, if the house doesn’t have a distinctive style or if the garden is far from the house, you have a bit of leeway. In these cases, the plantings can lend themselves to a particular style. For example, softer flowering plants lend themselves to a traditional look, while more structural plants, such as bamboo, can relate to modern designs. Regardless of style, sheds are viewed close up, so use high-quality materials. I avoid plywood siding and synthetics (vinyl and plastics). I pay particular attention to the craftsmanship of the doors, the size of the roof overhang, and the size and placement of the windows. The shed’s reduced scale makes the door a prominent visual element. Doors should be a minimum of 6 ft. tall. Their style can vary—carriage-door style, tongue-and-groove planks, or simple patterned doors all work well—but the emphasis should be on quality. For an unpainted door, cedar’s warm color tones and weather resistance work well. 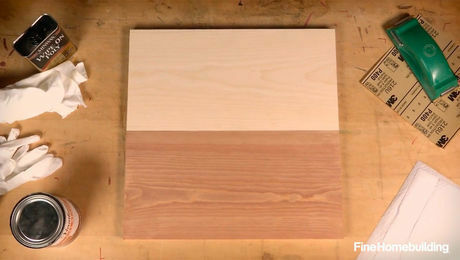 Fir and poplar are common for painted doors. I find that iron hardware works well with unpainted wood surfaces, while brass hardware is most appropriate for a more finished design. The roof should have an overhang to lend mass to the roof edge and to help protect the door. Without it, the shed will have an insubstantial and flimsy appearance. Even a 6-in. overhang can provide a distinct impact. Windows help to connect the shed to the house and help to break up the facade, especially on sheds that are the focal point of the garden or that are larger than 75 sq. ft. 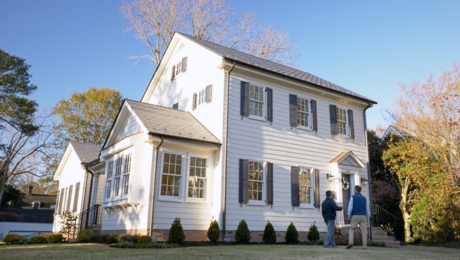 The windows and trim should be similar to those on the house. However, if your budget is small, I suggest passing on the windows and putting the money toward high-quality siding and an attractive door. Use siding that provides texture and shadow, such as clapboards or shingles. If you want the shed to blend in with the landscape, leave the cladding natural, or paint it a shade of green. To distinguish the shed from the garden, add color. The trim color from the house often is a good choice. In a larger garden, a shed can be bigger and be designed to be viewed from all sides. 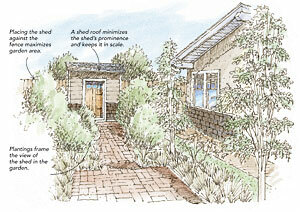 Often, a symmetrical garden plan will be centered on the shed with all views terminating at the structure. 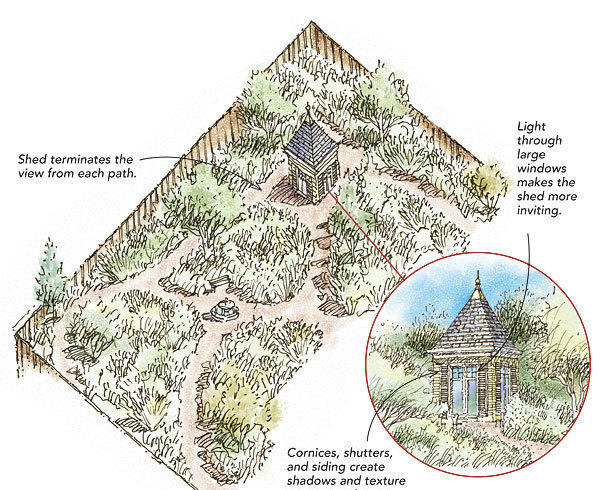 In this case, the garden is more picturesque than formal, and the location of the shed creates something of a hybrid. The steep roof and finial are visible throughout the yard, so it’s the central element of the garden. Also, the structure incorporates a high level of detail, reflecting its prominence. But the shed is slightly off center, and the curved paths and plantings conspire to hide portions of the shed so that the view changes and surprises as you approach.